Currently, the most popular SNL video on YouTube is the "Undercover Boss" sketch featuring Kylo Ren. It has 32,820,334 views. I could've sworn that the #1 spot used to belong to the "Sean Spicer" sketch with Melissa McCarthy, which is a bit interesting because that sketch came out more than a year after the Kylo Ren sketch. So that would mean the Sean Spicer sketch had more of an initial surge in popularity, but it hasn't been re-watched as often. Spots #8-10 are taken up by parodies of the 2016 Presidential debates. 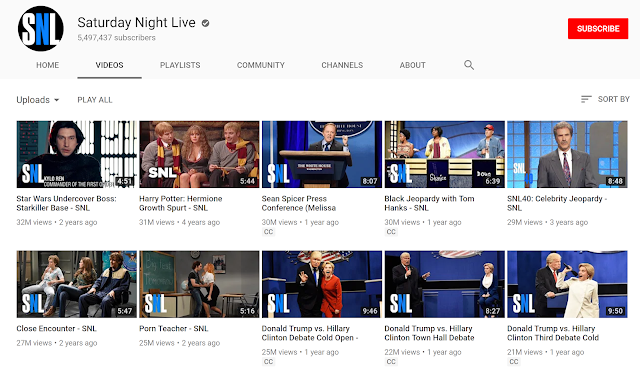 The Sean Spicer sketch is currently #3, and I expect the Black Jeopary sketch will soon overtake it in terms of viewcount.